Ever exquisite in her writing, Greta Gerwig’s directorial debut, Lady Bird, is as miraculous as its title character, the winsome Christine “Lady Bird” McPherson (Saoirse Ronan). 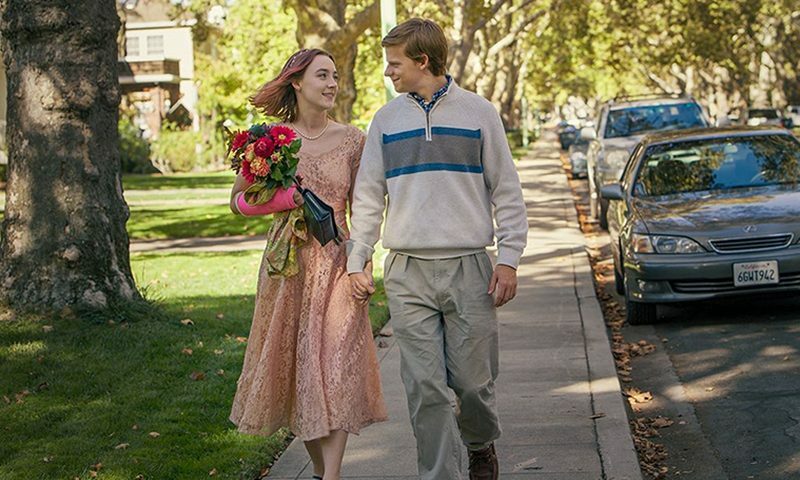 Surprisingly self-attuned with a flair for the dramatic, Lady Bird is a senior at a Catholic high school with her sights set on culture and college on the East Coast—on escape from the wide-streeted suburbs and dusty-rose skies of Sacramento, 2002. Led in by Joan Didion (“Anybody who talks about California hedonism has never spent a Christmas in Sacramento”) and accompanied by sharp cuts and witty dialogue, we’re quickly and breathlessly entrenched in Lady Bird’s world. She and her bubbly best friend, Julie (Beanie Feldstein), share girl talk while snacking on communion wafers and then audition for a musical together. She discovers and unabashedly pursues first love: with the gentle Danny (Lucas Hedges), who dreams of Paris; and with Kyle (Timothée Chalamet), who plays in a band, reads Howard Zinn and hates money. But as much as Lady Bird is a coming-of-age story, it’s also a depiction of family and class—one that Gerwig crafts with care, without romanticizing or infantilizing—rooted in the mounting and crashing tensions between Lady Bird and her mother, the tough and forthright Marion (played spectacularly by Laurie Metcalf). Gerwig’s is a true picture of how Lady Bird might experience class: She dreams of the wealth she’s surrounded by at her Catholic private school, stuffs a magazine down her skirt that her mother refused to buy for her, and is at an unusual loss for words when she discovers that her good-natured father, Larry (Tracy Letts), lost his job. Together with Marion, Lady Bird scours thrift store racks for the perfect prom dress, cries to The Grapes of Wrath on tape, and attends open houses to lovingly wander through California mansions. More often, though, Lady Bird and Marion fight, increasingly about Lady Bird’s insistence on attending an expensive, out-of-state college and her seeming embarrassment of her working-class upbringing. Neither daughter nor mother dare back down, but Gerwig treats both with generosity and empathy. We catch glimpses into Marion’s moments of softness (one of Gerwig’s most masterfully directed scenes features Marion, alone) and Lady Bird’s sorriness, gratitude and eventual discovery (or more, recognition) of love and home.